Large 3D letters for use outside The exterior grade letters are weather resistant, durable, base weighted and reusable as well as have a hard surface coating of fibreglass. The letters are 915mm high by 305mm thick made from polystyrene and coated in a layer of fibreglass for strength and durability. 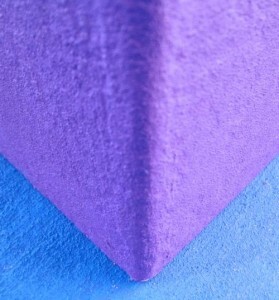 The surface is painted in a textured matt masonry paint. Fibreglass letters are ideal for short term use outside in all weathers as a visual advertising medium, they can be reused repeatedly if taken care of. If left outside for long periods of a couple of years the letters will probably need repainting to freshen them up. These are display letters and are not designed for standing on or playing on. For permanent use outside we would recommend an extra layer of coating and reinforcement especially if they are going to be put on their sides and used as seats. Fibreglass letters are a new product for us and it has taken some time to work out the process as polyester resin usually melts polystyrene. We do not use a mould to make the letters, we cut the letters out of polystyrene and then seal the letters before coating them in one layer of fibreglass and resin. The fibreglass leaves an attractive finish which we then cover in a fine textured paint mix of our own making before coating in standard masonry paint purchased from Dulux. We recommend Dulux paints because they are a reliable source for quality and colour matching to BS RAL and Pantone colours. 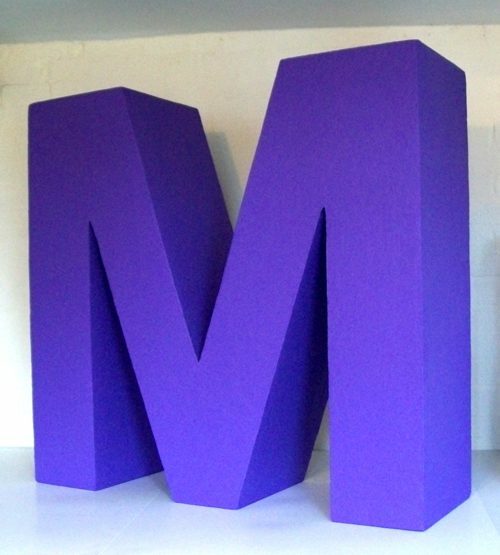 The ideal size range for fibreglass letters is from 500mm high up to 1200mm high. Big bold fonts like Helvetica Bold are most suitable or thick Serif fonts like Clarendon Bold or Rockwell Bold. Fonts similar to Times New Roman should work but we would need to reinforce the thinner strokes and would need to do some more tests before hand. Commercial Script type fonts are not suitable for making in fibreglass unless they were going to be supported with a back panel support or they were going to be fitted to a wall as a permanent fixture. If you are interested in fibreglass letters for display use, exhibition use or other promotional event then please feel free to get in touch and see if fibreglass letters would suite your next project. The image on the left indicates the finish achieved, the image was taken with a digital camera from 150mm distance from the object. We produce the letters with a textured finish because it is easier and quicker to get a result that is of use as a display. If a smooth finish is required the lead time to make them would be longer, as the process would be different and would involve more time and hours to produce.